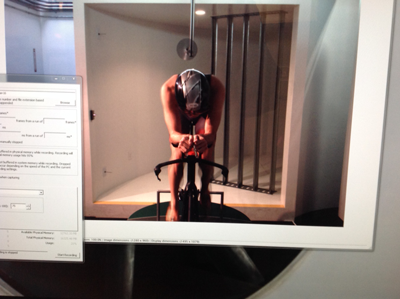 I sat on my new Ventum One on Friday for a final fit session and a preview of the wind tunnel test the following day. This bike fit is much more aggressively aero than on my 2011 BH Aero. It involves changing how I sit in the saddle into a more forward rotation of my pelvis and a much lower bar position. So far, so good! Saturday morning, I was a bundle of nerves wondering what it would be like to pedal the new bike, and learn if I could be an aerodynamically fit rider on it. 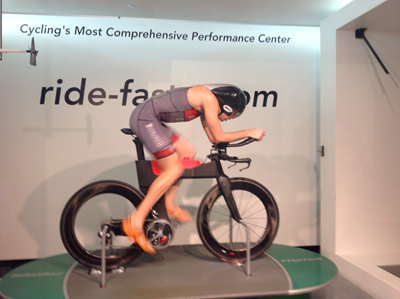 The wind tunnel at Ride Faster is built specifically for cycling tests. The air travels through a racetrack shaped loop, with power fans that push the air at whatever velocity is dialed in at the control panel. Vanes in the center of the tunnel before and after the straightway where rider is situated help keep the airflow laminar and smooth after it comes out of the turn, and going back into the turn after the rider platform. The platform in the middle of the test area has stations that lock the bike in place. Both wheels sit on on rollers. The front wheel is driven to the same speed as the tunnel air. The entire platform can be rotated to different angles to measure wind resistance (drag) at different yaw angles, just like in the real world. Beams of laser light form a roadway picture with perspective on the front “wall” so that the rider has a line of sight, horizon line, and reference points to simulate riding on the road. Warming up. This is going to be cool! e computer, and in notebooks, while both photos and videos are taken from the front and side views. 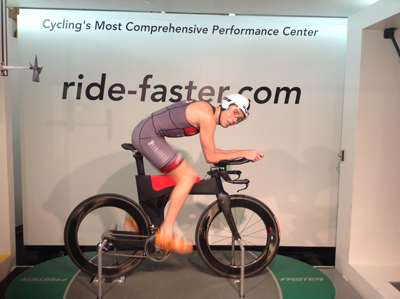 I wore my most slick and aero tri-suit, a sleeveless Champion Systems model. Aaron Ross, the tunnel tech, started me off wearing a Kask Bambino helmet. This one has a very short tail on it, a built in lens, and is very similar to the kind I have been racing with recently. Aaron warned me I would be getting a good workout in the tunnel. He said we would take 5 passes, the first one, a baseline, being the longest. He would make small adjustments in the bike fit, the way I was sitting or holding the bars, and or the helmet between each pass. During each run, the computer reports instantaneous measures of drag, but these are constantly changing at the rider pedals and moves around, so they rely on a series of 20 second segments during which all those instantaneous readings are averaged. Some of the passes involve rotating the platform to see how well the rider and bike respond to different yaw angles of wind. The tech has a microphone so he can give instructions to the rider to move a certain way while the test is underway. For this, Aaron gave me code words for when to stop and freeze, and where the pedals should be for those freeze frames, and he gave me code words for when to alternate head positions. The two head positions included my old school one, a bit higher up in the air stream, and the recommended, lower one, in which my head and neck align more with with my spine and I use only the slightest upward angle to maintain my sight lines under the front edge of the helmet. The new bike and position Aaron had me in felt pretty good. After warming up a bit, I took the pace up to 200 watts of energy, which the control panel said was 28 mph, I added just a little bit more power, matching the wind tunnel air speed of 30 mph to my bike speed, at about 207 watts. Aaron had me move my hands around, rotating them in and out, and shifting them forward and back. After few minutes, He requested a stop, freezing the pedals at 3 and 9 pm. This ended the first pass. Aaron came into the wind tunnel and spoke with me about the first readings. Without going into the numbers, he said I had done well, but he wanted to make some minor adjustments to reduce drag. So, he moved the elbow pads closer together, about 1 cm each. The elbow pad shift brought the drag reading down, by a tiny amount, approximately 43 grams. For the 3rd run, Aaron shifted the elbow pads back 3 cm. This allowed my hands to rest more comfortably and naturally on the bar ends, while placing my upper body weight more correctly over my bone structure on the pads. My drag reading came down another 61 grams. This time, Aaron brought in a different helmet, one with a long tail. It is a narrow helmet, with a built in lens over the eyes and nose, the Bell Javelin. Another 82 grams gone. The biggest change yet. View from the head on camera in the control monitors. For the final pass in the wind tunnel, Aaron put a thicker pair of foam pads on the elbow cups. This was more comfortable, but raised my shoulder height a bit. Yet, another 73 grams was eliminated. The drag reduction on this last run by now included not just adjustments on the bike, but my growing comfort on the bike, my new riding position, and getting quieter and more stable in it. Aaron explained that I had done very well for the first time in a totally different riding position, and on a new bike. He said in 6 months, I should come back, and he would lower the stack height of the bars to get me lower and more aero. It would have been too much to do all at once. He said that Tour de France pros who work for years on their technique for time trials have lower drag scores, but that is form the immense amount of time they have spent in the tunnel, and refining their positions. I was in my very first session in a new position. It would take time. Unfortunately, I did not test my old bike and position as a baseline, so the drag gains on this day were all relative to a baseline score on a low drag Ventum superbike. I am sure that with time, I will lower my drag numbers, with experience and another session, and fitting adjustments this summer. 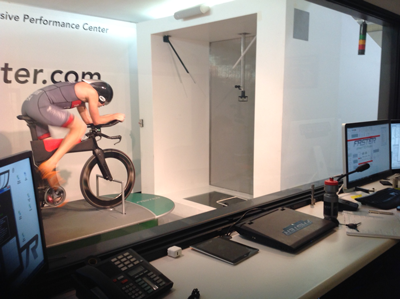 Cycling Power Lab has very good information, including benchmark comparisons for power production and drag in cycling. The most common unit of comparison is Aerodynamic Drag, CdA, which is a product of both the object’s slipperiness (coefficient of drag) and its effective frontal area. 1.15 A person on a road bike, riding along with hands on the upper bar. Total CdA is the force, or energy, in watts to overcome the combination of slipperiness and frontal area. From an average CdA of 0.32 for a typical cyclist on a conventional road bike in the drops, here are some estimates from Cycling Power Lab for top Pros on their time trial bikes. How Did I Measure Up? Comparing to me, I started the session at a CdA of 0.28, and got down to 0.2645 on the last pass. The difference in grams of resistance reduced over 5 passes was 258 grams, a little over half a pound. At 27 mph, this is a difference of 17 watts in power. At this point, I am “optimized” for a non-pro rider, and very competitive. To get down to the level of a top Tour de France rider, say, 0.235, I would have to improve my CdA by 11%. That does not appear to be unreasonable, given where I am right now on a new bike in a new position, with the potential to lower the bar height in a few months. I can sustain 285 watts for one hour in an Olympic distance triathlon. It would mean a bike split of 55 minutes. My previous personal best is 58 minutes. The difference is in drag reduction. Using a full disc rear wheel reduces drag another 65 grams (8 watts at 27 mph). Using a Torhans water bottle on the bars redcues drag a few more grams. Thanks to Aaron Ross at Ride Faster and to Ventum Racing for the great start.